Being more in tune with your own self helps you trust your inner wisdom. You always have the answers at your fingertips if you can trust and listen to your heart. Benefits of Reverse Warrior Pose. Reverse Warrior strengthens and stretches the legs, groins, hips, and the sides of the torso and waist. It improves flexibility in the spine, inner thighs, ankles, and chest. It also builds strength in the thighs, shoulders, and arms. Here are some alignment tips to help you build a stronger foundation. In June our studio theme is all about calming the mind. Tried tested and true are 5 obstacles to our awareness. They are, with the first one being the foundation of all the other obstacles; ignorance, the false ego, attachment, aversion and fear of death. Only when we have moved through these obstacles, we can begin to calm the mind. When we are blocked by fear or anger it prevents the upward current of liberation blocking our downward current of manifesting. When we can let go we can allow our energy to flow. For us one of the best techniques to release fear is to sit with it and observe it. To be in it but not of it. This does not come easily as the mind will be averse but with practice the energy begins to flow and the creating of what you want begins. 1. I can’t do yoga because I am not bendy? That is why we do yoga to become more bendy. Yoga is a practice. It takes practice. 2. I am not a super model in yoga pants! Neither are we. Yoga is for all shapes and sizes. 3. Yoga makes me fart. Yes it does. You will experience the “I have to fart what do I do.” Try not eating 2-3 hours before your practice and use the washroom before you start. 4. What do I wear to yoga? Anything that allows you a full range of motion and that you feel comfortable in. 5. What do I bring to yoga? A yoga mat, a water bottle, yourself. 6. Do I wear sneakers or socks in yoga? No bare feet on the mat allows for you to open the toes and will help you grip the mat. Rubber souls of sneakers will ruin your yoga mat. 7. I am not religious or spiritual can I still do yoga? Of course. Yoga is about connecting to your body through breath. It can be spiritual but it does not have to be. 8. What if I fall asleep during shavasana (pose at the end of yoga)? That is ok the teacher will wake you up when it is time to go. 9. How do I find time for yoga and the gym? 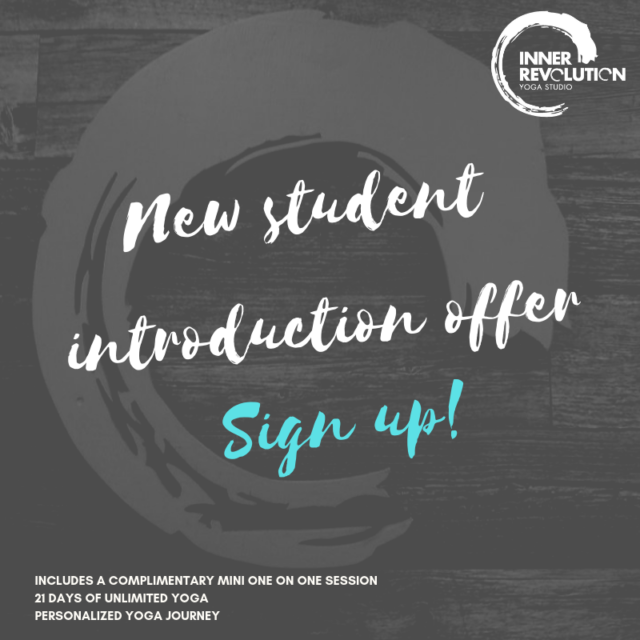 At Inner Revolution we have lots of classes on our schedule to help you fit both in! 10. How often should I practice yoga? As much as you can. You will see the benefits of yoga 1 a week but for optimal results 3-7 times a week. We went out of town this past long weekend and it was so great just to be with my family. I love my family so much and when we can just be it allows us to connect deeper and really get to know each other. Another part of what I love, being out of town is the chance to go and visit other yoga studios. I had a chance to practice the primary series with Daniel at Bliss Yoga studio in Barrie. It was such a delightful studio with an amazing view. I can’t wait to go back! On of the things that can overwhelm me with anxiety is having a lot to do. With so much going on our lists can pile up and leave us feeling like there is not enough time in the day to get it all done. To help our brains organize all the things we need to do it helps calm the brain when we can create a list and prioritize what is important. A simple chart in order of importance or a priority matrix can help ease the brains response to shoot us into our mental list. It helps us get it out and when it is out the brain can relax. I do this wonderful exercise every hour on the hours. I set up my phone to give me an alert that it is time for me to check in. This exercise is particualrly helpful when you are in a reactive and stressful state. The purpose of this check in is to see what brain state you are in. If you are not aware of the states of the brain please read the post before this on brain states. This simple yet profound expertise can help you move from your lower centre brain to your higher centre. In turn you will feel better, perform better, and have more ease in your day! Reptillian Brain: At this level we are consumed by stress, fear and anxiety. We are in fight or flight ready to react. Mammalian: At this level we are still anxious and have stress but are not consumed by it. We want to connected and be loved and wanted. The last 2 brain states are the higher centres of the brain and are working in our neocortex. The first level in the neocortex is where we feel balanced, grounded and present. We are mindfully aware of everything around us and it does not effect us. We can be in this world and not of it. The second level of the neocortex is where we are again balanced and grounded but there is a glow and a light about us. We are at peace. This month for us is about checking back into our centre. Mental health is very important. Our mental capacity can only operate on high for so long. Checking in with your emotional state is a great strategy to see where you are. Last week I was speaking with a doctor of Heilkunst and she told me about a training called Emotional Brain Training. Emotional Brain Training is a program developed at the University of California San Francisco that is based on research from neuroscience, stress science and psychology. It teaches a set of skills that targets our emotional brain. The impact of rewiring our brain through simple activities of turning in to our emotions to rewire our brain is transformative.